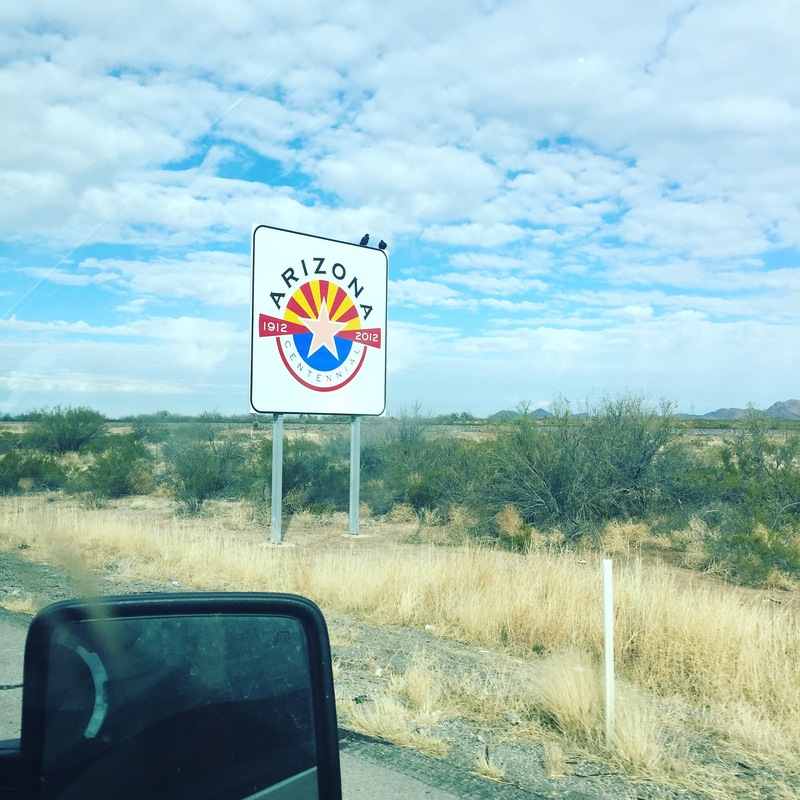 Welcome to Arizona… You’re too Young to Stay Here! Excited is an understatement for what I felt to be driving into Arizona! I have never been, Rodney on the other hand, this will be like his 5th trip. Although he is also excited to experience Arizona with me and Wyatt. Now, let’s get down to the real big stupid thing I did, shall we? Did I book our RV reservations ahead of time? Nope! Why? Well, there were SO MANY I really did not think it was going be an issue. I started down my list about 3.5 hours out. What did I find? “Oh we are 55 and up, you don’t sound like you are 55”. “Do you have kids? We are adults only”. This was What I heard over and over and over! Finally, I got a nice gentleman on the phone who also told me I was probably not going to find a reservation even if I were over 55! All the resorts in town are booked solid. He also said out of the 5 resorts that do allow families, he wouldn’t send anyone he cared about to them. I should look at the casino an hour out of town or in another city. Ok. Everything is going to be fine. No vacancies. No children. $60 a night. Nope. Then, we passed a really cool RV park. We were still about an hour out of Mesa. This was Picacho Peak RV. Beautiful spot. Gorgeous saguaro cactus everywhere. They had a spot! It was reasonable! I told her we would be right there, we were turning around. As we pulled up to see the 55+ sign I got a phone call. From the only advertised family RV park close to the convention center where we need to be all weekend. I had left a message earlier. Bonnie said they had a vacancy! And it was affordable! Too good to be true? Yes. I then looked at the reviews because earlier I was on a fast and furious calling spree. TERRIBLE reviews. They read like a soap opera! Once upon a time the place was a disaster when Bonnie was in charge, drug busts due to the fact she let crack heads and homeless sleep in the showers and wherever they wanted. She was apparently always drunk and high. Then she went to prison for a few years. Another couple cleaned the place up. Yay! Then Bonnie got out of prison. Guess what? She went back to work at the RV park. Now, I’m all for second chances but when the reviews are not in your favor post prison, I just can’t take the risk with my family. I’m not ready for Wyatt to be around crack heads. And maybe it was a lie. But, the number of bad reviews couldn’t be wrong. Right? Instead we ended up at a nice resort an hour north. Which I’ll review when we leave. So far so good. The drive through Phoenix was like driving through Dallas. Traffic. Traffic. Traffic. 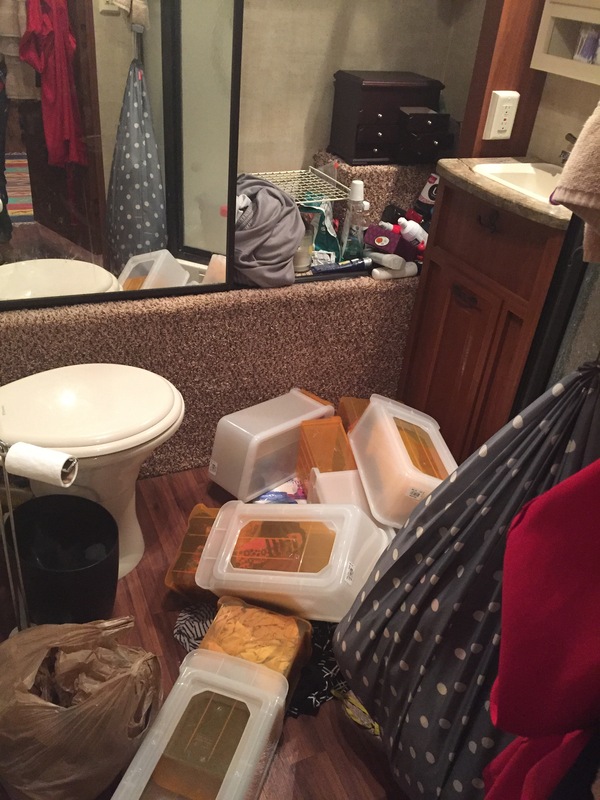 The roads were so rough they decided our bathroom needed to be reorganized! And that stuff was locked down!! The drive took about 2 hours more than anticipated. But Wyatt was a champ! So where do you take your mostly patient 3 year old to thank him for not screaming at the top of his lungs for the last 4 hours of a long, long day? Peter Piper Pizza! Luckily it was empty. He had a blast! He said, “this is the most fun day ever!” We let him trade in his tickets for a prize at the grocery store though, because seriously when will you ever be able to win something better than a pencil at Peter Piper Pizza? Or Cheese Mouse Pizza, according to Wyatt. He was disappointed the “cheese mouse” did not make an appearance. After a trip to Albertsons we are now home, snuggled in, ready for bed! Woohoo! Arizona so far, is just gorgeous! I can’t wait to hike! I can’t wait to see more of this state! Sheena, I never know whether to laugh or cry when I read your posts! Mostly, I laugh, because I know whatever was happening is now past, and you are all fine and happy. Thanks for sharing! We have supper at church, tonight. Will be thinking about you! Tell everyone hi for us! We miss y’all! Oh my gosh…you are hilarious but a huge dork! I guess you will start calling the next town to find a campsite before you leave your current location.